If you are not used to sleeping on a futon, it might be an uncomfortable experience for you. In essence, a traditional futon is basically a mattress that is put on the floor. However, a majority of Westerners are not used to sleeping on the floor, so they have modernized the traditional Japanese furniture to include a frame. With that said, if you are one of those who has a futon, but does not have a frame, maybe you should consider getting one. That is because there are several benefits to owning a futon frame. 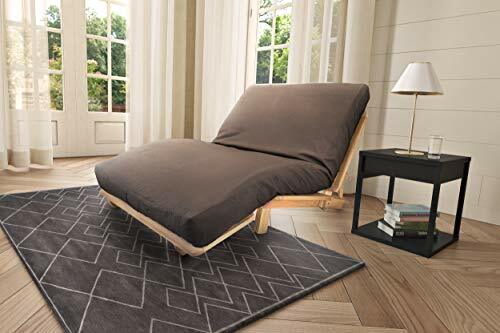 If you have a small apartment, but you have regular guests, maybe getting a futon frame would be a better experience for them as opposed to a futon that is placed on the floor or chair. That is because such can make the users feel as though they are lying on a piece of carpet, sleeping bag, or sofa. Futons also do not take up a lot of space, so it provides you with a win-win situation. Additionally, since, usually, futon frames can be converted into a lounge, sofa or bed, you get a sofa for your guests to sit on, a bed when needed and in some cases, depending on the frame you buy, you can get storage space. So, if these details have added to your interest in investing on one, we are happy to tell you that we have considered reviewing a futon frame that you might want to consider buying. KDA Frames is a USA-based company that has manufactured this futon frame in different sizes including twin, full or queen. Below, we have chosen to review the queen-sized version. Design: The frame is a tri-fold one which makes it capable of being folded from a love seat to a lounger and then to a bed. In total, this product can be changed into thirteen various positions, specifically eight lounging positions, four love seat positions and a bedding position. In addition, the footrest can also be altered into four up and down positions. Construction: This queen-sized futon frame has an approximate total weight of 55 pounds and a size dimension of 61 x 9 x 6 inches. As a platform bed, it has a height of about 10 inches from the surface which can be done by raising the footrest. Material-wise, it is made using a pure, kiln-dried hardwood material. The KD Frames Lounger Futon Frame might be a smart option as it can be converted into a sofa, lounger or a bed. It has a natural wood finish that can fit with most decors, and even if you don't fancy the color too much, you can recolor it by adding paint or a stain without causing damage to it. You can also choose a specific futon frame that suits the space it is intended for as it is available for purchase in twin, full or queen size. While the features make it highly attractive, it is not a perfect product. That is because you need to spend on a mattress. If having to buy a mattress was not enough, you also need to buy a specific mattress as all futon mattresses are not all are designed for use with a tri-fold lounger. Also, although the manufacturer boasts of its multiple adjustments, this can be a bit annoying and awkward for you as you might have a hard time finding the perfect adjustment feature that suits your needs. Searching for the best futon frame will never be achieved if you will not consider or check out another brand or model. With that in regard, we have chosen to compare the KD Frames Lounger with the Epic Furnishings Houston All Wood Sit, Lounge, Sleep Futon Frame. Like the one from KD Frames, it has thirteen positions and a footrest. It can also be put in a reclined position as well as a sleeping position. Likewise, it can be converted to a 10-inch high platform bed quickly. It also has a wood finish and can be assembled with or without the help of a professional. Additionally, it also comes without a mattress, so you will also incur extra cost and need to find a special mattress. Nonetheless, this frame is only available in twin and full sizes. In addition, while the KD Frames Lounger has a classy wood finish, the Epic Furnishing Frame has a bit of a park bench wood finish. So, if you buy this frame, you may be tempted to embellish it with paint, varnish or stains to give it a contemporary finish. As compared to the one from KD Frames, this might be a bit difficult to assemble and convert. That is for the reason that, though the instructions are included, it may be a bit difficult to follow as some parts may have been missing in the packaging. Thus, you should always check for and return all products that are shipped to you with missing parts. It seems as though futon frames are just that, futon frames. They don't come with any accessories, and you have to purchase extra. However, despite having to buy the mattress separately, there are still a lot of benefits of owning a futon frame. The KD frames Lounger can possibly be an excellent addition to your home furniture. It is easy to set up and assemble, tri-folding, and sturdy. To add more, it has a classy finish that will make it fit any home interior designs and decors. What is better is that, even if you are not comfortable with the original finishing, you can embellish it.